Once Download is clicked the Download Manager will download the files, extract them to the proper folders, and load them into Bible Analyzer where they will be immediately available for use. 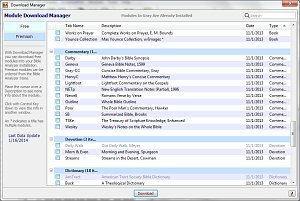 There are over 100 low cost, premium titles formatted for Bible Analyzer available, some exclusive. They can be easily ordered from the Bible Analyzer Store. They can be immediately downloaded with the Download Manager and also the download links will be emailed to you immediately after completion of your order. To browse the Downloads at the store, click here, Bible Analyzer Store. To view a description or order a module at the store, click the title. There are at least 26 English and 19 non-English Bibles available completely free by using the Download Manager (see above). Among the titles, AV-1611, AKJV, ASV, BBE, ISV, KJ2000, LEB, NET, etc. There are at least 12 free Commentaries available using the Download Manager (see above). Among them are, Treasury of Scripture Knowledge, Enhanced, Henry, Gray, Newell, Darby, Wesley, Hawker, Lightfoot, etc. 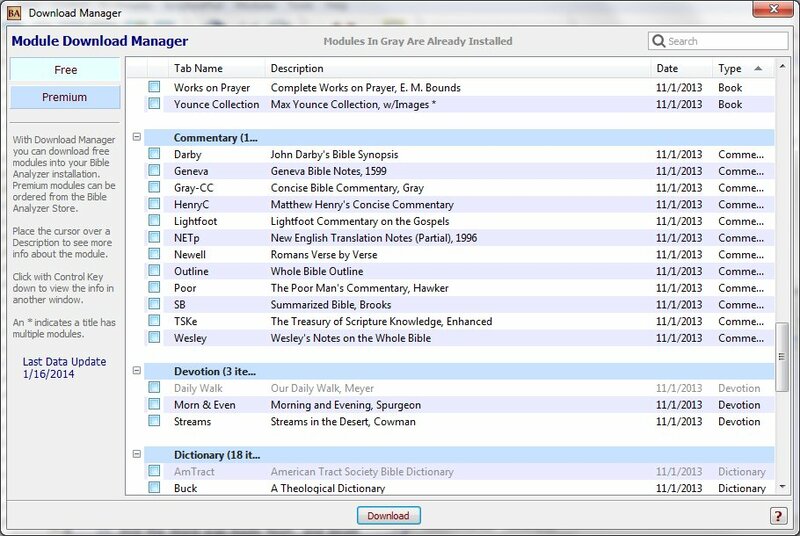 There are at least 17 free dictionaries available using the Download Manager (see above). Among them are, Nave's Topical Bible, Torrey's Topical Textbook, Thompson Chain Refrences, plus more by Smith, Buck, Hawker, Morrish, Webster, etc. module. The small price that is charged is not for the material itself but for providing that material in a format which can be utilized by a powerful study tool such as Bible Analyzer.